We follow frontline practices and principles, and we receive training requests. As kloia, we wanted to create an innovative way of doing training. Our first training classes followed a classical, didactic training format with one-way of communication, from which neither of the parties were fully satisfied. There should be other remaining part of the “Satisfaction puzzle”. We had to find those parts! We converted the trainings to workshops where the attendees are given scenarios and steps to achieve to the expected targets. This worked better as the attendees were more engaged. However, we noticed that the attendees were not fully committed to the sessions, copying and pasting the introductions provided. This did not help with internalizing the topic, the attendees were not fully getting the process… here was a last missing part, but what was that? 3- Concrete Practice: An end-to-end exercise(s) related with the topic. 4- Conclusion: The subject learned by this time is summarized in 1 or 2 sentences. 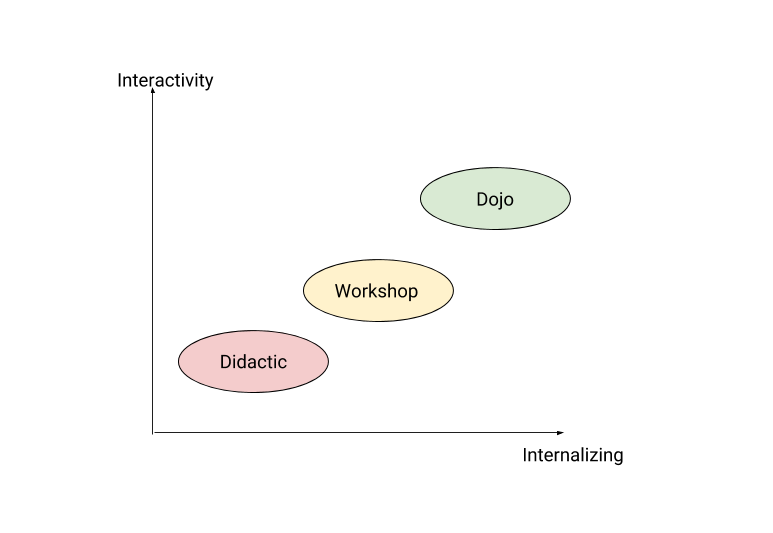 Based on this discovery, we converted the workshops into “Dojo”s, a format in which the attendees investigate the solution path themselves. So we define “What to do?” and attendees should find “How to do?” . Each Dojo consists of several Katas, that is, several exercises. Less slide, Concepts are discussed on whiteboard! No step-by-step instructions, Google it! Asking question is FREE, Ask it! Whoever finishes the kata, help the others! Please refer to kloia training page for more details on Dojos.